Lots has been said of the horse’s life at a barn. Studies have been made to translate what each twitch and gesture communicates to the rest of the herd. An equal amount of less scientific study has been done to analyze the human residents at the barn as well. Most of these are comical in nature. EquineInks post yesterday is one of these studies that shouldn’t be missed! It is a sad thing indeed, however, if while at the barn one gets too concentrated on the discipline of riding and the social opportunities at every washrack to enjoy the abundant nature reserve they’re visiting. A few silent moments is all that is needed to appreciate a conversation between the birds in the trees or the rhythm of the water in a creek. If you don’t have time to stray from the barn there is still plenty of wildlife all around you. Now is the time the barn swallows are building their nests preparing for spring. Some barn owners consider them a nuisance and go to efforts to discourage them from nesting in the barn, but I enjoy seeing the baby birds poking their heads out of the nests high above the stalls until they are ready to fly on their own! 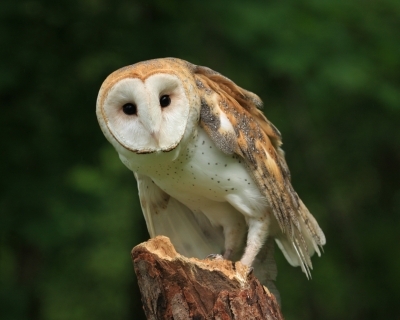 Several barns I visit have barn owls which are more difficult to spot during the day but have made the occasional appearance, and their “hoot hooting” is unmistakable. Blue Herons are one of my favorite residents at barns that have bodies of water to host them. 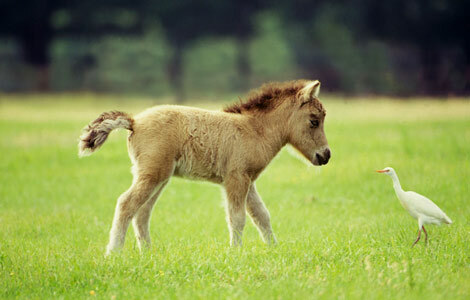 Care must be taken, however when riding by them as their sudden flight may startle a horse. Still worth having them around! When catching your horse from his paddock, check the fence line for hawks, they sit very still and wait for mice and other small animals to move in the field before snatching them up and flying off for dinner. I have seen them carry away small snakes. These birds are but a few of the ones you can see and the hundreds you can hear if you slow down, listen and observe what’s already there. Slow down when you have the chance and listen to the wind, the gossiping birds and the horses happily snorting and stomping. Experience life at the barn as your horse does, you won’t miss much if you take one less cellphone call to do it. Don’t let the pressures of everyday life hurry you into missing all of the glimpses into nature’s conversations that we are privileged to by virtue of our horse’s friendship. Horsey Lessons from The Birdhouse Chick…..
Life as a horse trainer, at least the kind that works out of many barns, is a particularly transient one. Either because of the nature of my business, or that I grew up a military brat (I haven’t figured out which) I move every few years. Because I meet most of my roommates at the barns or stables where I work, I tend to live with dedicated animal lovers. As anyone who knows her can tell you, Animal lover, in respect to my roommate, Beth Wheeler, is an understatement! Beth, the proprietor and namesake of the unique bird house boutique, The Birdhouse Chick, is one of the most dedicated stewards of the environment that I know. An entire blog could be written on her selfless acts of caring for stray dogs and cats, and her yard is a testament to her love for birds and other wildlife. 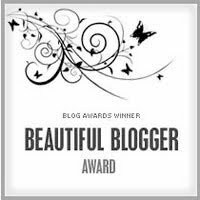 Check out her website and daily blog, she is the one that started me blogging. Beth also has a horse, Sweets, that she keeps at Moonlight Equestrian Center. While I was racking my brain for a blog topic, Beth was washing some blankets for an older horse at the barn. She suggested I relay what she does with the dryer lint and horsehair cleaned from the washer after we wash our blankets, saddlepads, etc. Brilliant…Take a mesh produce bag- the kind you buy your horse’s apples in- and begin filling it with the hair, (body and tail), from the lint trap of your dryer, and from the inside of the washer and dryer after washing dirty horse items. You can also supplement the bag with mane and tail hair from your tail brush or from pulling your horse’s mane. When the bag is full, tie it off and hang it from a branch in a nearby tree. The birds love to use the hair to build their nests! I have picked up used nests at barns that were made entirely of horse hair! I have attached a picture of a horsehair nesting ball that Beth made for our yard. We have the happiest birds around, and it is a joy to watch them in the morning before I set off to see the horses. Take some time to check out her website- the birds will love you for it! Uh…what was I saying again? As in my lessons, it is easy to get sidetracked in these blogs. Yesterday, I had originally intended to use my video clip with Scott Hassler to stress how valuable it is to videotape lessons, shows, and practice rides. It is difficult to override my admiration for trainers I deeply respect. Now that I got that over with there is another theme to explore in the same clip. If you didn’t see the clip, it is located at the bottom of the last post. 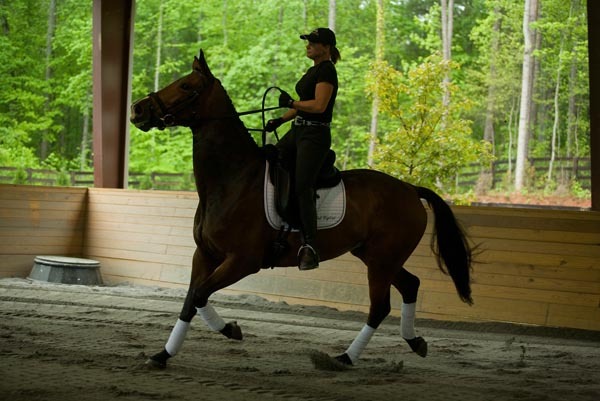 A common theme, especially with adult amateur riders, is how to handle a situation when a horse gets tense or spooks. It is not uncommon for a student to give me a list of the items or situations that cause their horse to spook. It is sometimes difficult for me to get the student to override their concern for these particular scenarios, and instead focus on the behaviour the horse is exhibiting when it encounters the fearful object or situation. 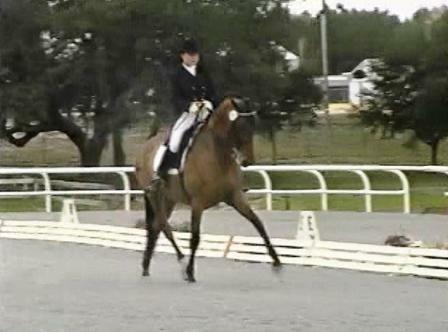 An example would be, fear of a mounting block in the corner of the arena. The horse shies and runs sideways each time it approaches the mounting block. Here it comes….”He’s afraid of the dang mounting block!”, followed by kicking and fussing. The mounting block, in this case, is immaterial…it could be a dog, a bucket, a plant, anything… the focus should be the loss of rhythm, and the falling in on the inside leg. This is something that can be corrected. You cannot predict every object you may come across in your horse’s life and train him not to be afraid of it. You can instead, train him to move correctly on your aids, and soon his trust will build when he realizes that your decisions have kept him safe. Having a conversation with your trainer about why he doesn’t like mounting blocks, hats, etc. is nice, but not conducive to fixing the problem. This is more aptly stated by Scott, in the video when an unseen person drops some folding chairs while I am cantering Lucy. There is a sudden “Bang” and Lucy immediately tenses up (she doesn’t look that tense but she felt it!) He calmly reassures me “There are no noises…just her body- if her body gets nervous, ride the body”. He offers the disclaimer “This sounds so easy from the ground.” But this is what we must aspire to. 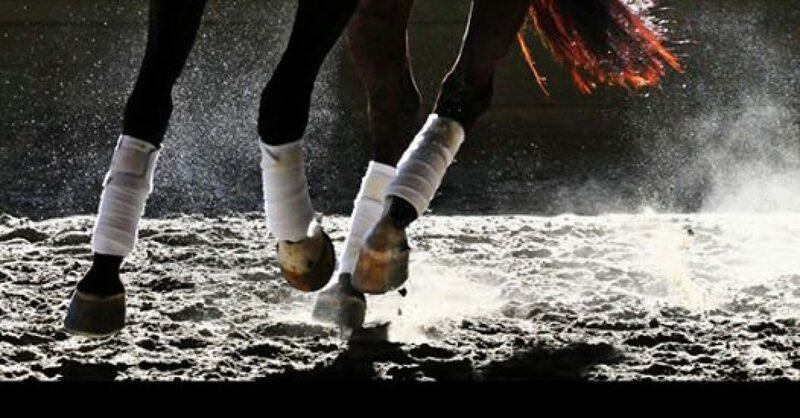 Ignoring the stimulus, controlling our adrenalin and riding the horse’s body. If the horse’s body is stiff (from fear) ride it the way you would ride a stiff horse. Don’t add in the element of panic. Nobody’s saying it will be easy. It will take time, but the first step is visualizing. Then practicing……then one day….Bang!!! !…Nothing.